VIP Cocktail Shaker. 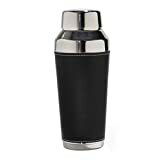 Stainless steel and faux black lether 23 ounce shaker. Includes separate stainer and lid.